Professional Development lunch on "Networking and Sales Success in 2019". 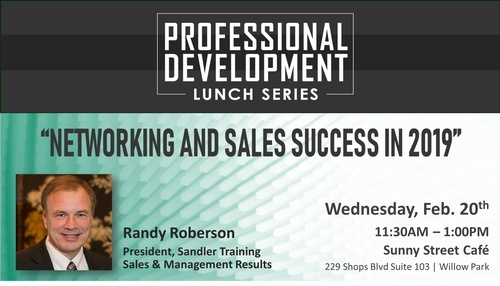 Randy Roberson, President of Sandler Training Fort Worth, will discuss useful networking ideas and take a deep dive into the buyer/seller dance. You’ll learn how to sell by not selling, how to do no-pressure prospecting, and why features and benefits are frequently not helpful. Randy combines energy, motivation, and humor while delivering useable ideas to business groups, trade associations, and other events. He draws on “10,000 Hours” on stage and his passion for “Bringing Awesome” will ignite the audience! Randy Roberson is a Partner at Sales & Management Results, a Sandler Training and Consulting Company. His firm provides behaviors assessments, sales & leadership training, executive coaching, and hiring packages. Sandler is the world leader in business development, sales and leadership training, and customer care training with over 250 offices worldwide.